NGUBANE & Co. Chartered Accountants was established in 1995 as an accounting and auditing firm. Its service offerings have since grown to include financial advisory, forensic investigations, business and IT consulting. This black owned multidisciplinary professional services firm is driven by commitment to deliver best services, with every member of the firm committed to a career and lifestyle of discipline, balance, continual learning and goal orientation. 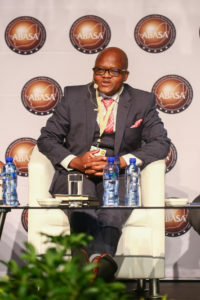 The South African Professional Services Academy spoke to Founder at Ngubane & Co. Chartered Accountants, Bhekabantu Wilfred Ngubane, about his personal, professional and entrepreneurial journey since 1995. What inspired you to join this profession? At the time when I started school at Msinga, where I was born, the community standard of measure of being educated was the level where one was able to write and read letters written to distant relatives, more particularly those local men who worked in Johannesburg. This is the service that we provided to the community with great joy since we got exposed to all the breaking news and some confidential information, e.g. reporting to husbands that “umakoti useqiwe izinyanga ezimbili” Looking back, I always realise how lucky one was to pursue schooling beyond that standard of measure, up to a high school level. I was introduced to bookkeeping by my ex high school mate who was working as a trainee work study officer for a motor assemblies’ firm, looking at the salaries for advertisements in the media for pay packages of accountant was a further motivation factor to resolve to study for the accounting qualification. What does the role of Founder mean to you in the organisation? I am priviledged and humbled by the role we play in availing training opportunities and indirectly creating employment to yound and aspiring black professionals who come from previously disadvantaged backgrounds. It is encouraging to see people providing for themselves and for others. What would you like your legacy to be at retirement? My wish is for the firm to continue growing and become a firm which, when future generations look at it, they bow in humility when they think or read of the background of the forefathers who built. One would like to have a firm that leaves a kind of similar impression you get when you look at and read about the pyramids of Egypt. My role is to create an environment where people will prosper. I have a complementary leadership where our professionals are supported, be it administratively or strategically to achieve our company goals, objectives, and have a sustainable business. Everyday is a new day for me, literally. Whilst we have short, medium, and long-term plans, I believe in practicing the work hard today to ensure you are in business the next day. I always compare our nature of business to the life of a bird, which even if there is so much fruit on one tree at a specific time, it can never take the fruits away for storage. Similarly, every year we have challenges, the tender processes, we need to be on the pulse to get work given the challenges in our economy and the global economic challenges. We must be at the fore-front of any socio-economic changes. We are faced with diminished quality of professionalism in our space and we need to figure out ways to get the best. It is a concern that our education system does not produce the same quality of post matric candidates even though it is the same education system. Is the majority of people who come through our education system employable? How have you taken part in mentoring others? We have a structured programme where people are linked to certain mentors. Regular feedback is encouraged at regular intervals. I sometimes do public speaking to encourage younger professionals to think of starting their own initiatives and empower themselves. I do encourage our senior officials to open up to the younger generation about their experiences and knowledge over the years, this goes a long a long way in creating a learning environment and skills exchange. A definite high is the over 250 employees we have since we started Ngubane & Co. in 1995. The lows for me would be between 2005 and 2006 when we lost 4 directors in the firm That was a big blow, such is life. The greatest beauty of time is that it heals. We have grown over the years, but we want to have a balanced scale in terms of having 35% of our work come from the private sector and 65% in public sector. This will assist us spread our work load evenly throughout the year. We are working on re-branding Ngubane & Co. that should be very interesting to allow for our growth and success over the years. We are taking our code of ethics seriously so that our employees don’t take this for granted. We endeavor to make ethical behavior a lifestyle of every employee of Ngubane. We are working on making values like the prayer in everything we do. By default, the very nature of our business supports those individuals in our society that were denied and deprived of opportunities. We are not there yet, but we are doing our best to bring our women on board in terms of leadership positions because it is our strategic commitment. A Daycare in Alexandra, and Madimanlou Farm School. We work with people and for people consequently there are times when some disagreements and complaints arise. When such happen, we do our best to resolve such without delay to keep our clients happy. We do thorough evaluations of the work that is done by our employees o to ensure quality work is delivered. What values do you hold dear and why? Chasing money has become a secondary priority, I am for the creation of opportunities and hope for others to help others and our communities to grow. When you not at work, what do you get up to and where can people follow you online? I am a casual runner in the mornings, we spend time at the movies and church with my wife as our four children are old and live on their own. Visit the Ngubane & Co. website for business updates of the work we do. I am getting all the help I need to run my personal Twitter account, watch the space!